"The winter plays havoc on our client parking areas. SM Sweeping keep those areas clear of snow, but maintains the markings and cleans the filth so our clients have a clean, safe area to enter our business." SM Sweeping Invites You to See the Difference. Founded in 1997, SM Sweeping is a Denver-based provider of parking lot sweeping, snow plowing and parking lot maintenance services to over 200 commercial properties on the Colorado front-range. Our satisfied and growing client base is the result of proven track record for superior customer service, competitive pricing and attention to detail on your properties. 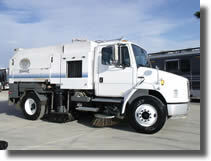 SM Sweeping crews are available for daily, weekly, and monthly property maintenance programs. Our friendly, knowledgeable crew and management is ready to help you develop a parking lot sweeping program that suits your needs and your budget.